The Island of Hawaii is often referred to as the Big Island. With over 4,000 square miles, it is more than twice as large as all the other Hawaiian Islands combined. The big island of Hawaii has many different types of topography or landscapes. You could be standing in a lush rain forest or standing on what looks like the surface of the Moon. You’ll find everything her from, active volcanoes, picturesque waterfalls, Koa forests, and pristine beaches. You will also find plenty of local entertainment, shopping, fine dining, world-class spas, over 20 golf courses, and top-rated resort hotels. Visitors will generally stay in or around Kona or Waikoloa, which are the two main developed tourist areas along the west coast of the island. Here is where you'll find plenty of resort hotels and restaurants along with entertainment facilities and shopping. The best time of the year to visit the big Island is from the late fall through the late spring. The summer months are generally the low season as it is a little bit hotter and humid. You can find direct flights to Kona from many west coast airports. Most of the higher-end 5-star & 4-Star resort hotels are located in and around the Waikoloa area on the west side of the island. From Waikoloa, you can see the island of Maui, 26 miles away. This ancient lava flow area is developed specifically for tourism. This area is set up with plenty of manicured landscape, golf courses, tennis, high-end shopping and fine dining. Shopping and dining centers include the Queens Market Place, the Kings Shops, and the Shops at Mauna Lani. These shops feature merchants like Tommy Bahama, Coach, Michael Kors, Roxy, Quicksilver and more. Since this area is developed primarily for the tourist, so you can find activities like a helicopter charter to view the island highlights, or swim with Dolphins at the Hilton Waikoloa’s Dolphin Quest attraction. Around 30 miles South of Waikoloa along the Kona Coast, you’ll find the main island town of Kailua-Kona. From the town of Kailua-Kona south to Keauhou Bay, you will find many more beach front hotels and resorts, like the popular Sheraton Kona Resort & Spa at Keauhou Bay. The town of Kailua-Kona is quaint, with its main ocean front street, Alii Drive, filled with all kinds of surf shops, boutiques, art galleries, activity centers, farmers markets, and lively ocean front restaurants & bars. You will find live music around here every evening, and plenty of sunset gazers taking an evening stroll for photos. You will want to spend some time walking around this lovely town as it has a great island vibe. The locals are super friendly and have excellent information to share about their island home. Around Kailua-Kona is where you will find your larger stores like Costco, Target, Ross, Macy’s, Kmart, Walmart, Lowes and more (just in case you need some emergency supplies). On the east side of the island you will find the historic waterfront town of Hilo. Hilo is about an hour drive from Waikoloa. While taking a stroll through downtown Hilo, you will find historic wooden storefronts, cultural sites, small shops, galleries and restaurants. Be sure to walk around the center of town. It is an authentic taste of island life. It is often raining on this side of the island, so bring an umbrella or rain hood. A large population of the island lives in the Hilo area because of its more affordable real estate, as well as the authentic Hawaiian culture and pleasant lush rainforest. Here you can visit the Mauna Loa Macadamia Nut factory, Hilo Hattie, Big Island Candies and the popular Hilo Farmers Market. There are some nice hotels in town if you want to spend the night, but most people simply visit Hilo for the day or stop there on the way to the nearby Volcanoes National Park. While in Hilo, visit some of the beautiful local parks, hot pools, waterfalls, botanical gardens, and other popular sites around the area. This eastern Hilo side of the island boasts several beautiful botanical Gardens, hiking trails, panoramic view spots, and waterfalls for your enjoyment. In the Hilo area you'll find Wailuku River State Park, with it’s picturesque Rainbow Falls. The morning sunshine often creates a rainbow over the waterfall, giving it its name. The popular Onomea Falls is located inside the lush Hawaii Tropical Botanical Garden Park just north of Hilo. This is one of the best botanical gardens you can visit. Further north of Hilo visitors will also enjoy the popular Akaka Falls State Park. This park has beautiful streams, walking trails, and foliage. For spectacular scenic views, the Waipi’o Valley Lookout on the north eastern shore of the island is a popular spot for awesome photos of the vast lush valley below. Located below the lookout in the Waipi’o Valley, the spectacular Hiilawe Falls are over 1200 feet tall, making it the tallest waterfall in Hawaii. The other popular lookout is the Polopu Lookout, but it is only accessible from the north end of the island. The island has two notable volcanic peaks that rise above 13,000 feet above sea level. The peaks are Mauna Kea and Mauna Loa, an active volcano. Mauna Loa is 13,679 feet high while Mauna Kea is 13, 796 feet, and is home to some of the most important astronomical observatories. In the winter time the peaks will get snow and it is not uncommon to see people ski and snow board on the slopes. If you visit, be sure to dress warm as the temperature can drop below freezing at the summits. One of the main attractions of the big Island of Hawaii is the active volcano region. Volcanoes National Park is located on the south east shore of the island, around a 40-minute drive south of Hilo. Volcanoes National Park features the Kilauea Volcano which is still active today and you can generally see flowing lava and volcanic gases rising from the crater. A popular visitor spot in the park is the Thurston lava tube. Historic lava flows have formed tubes leading from the center of the volcano towards the ocean. As the outer crust hardens it leaves a hollow tunnel like tube that you can walk through. At the coast line of the park you may be able to witness Lava entering the ocean, when lava is flowing. At the center of the park, Crater Rim Drive (which is closed from time to time) is an 11 mile drive that circles the volcano and has several scenic views and great hiking trails. Just outside of the park on the slopes of the Mauna Loa volcano, you can visit a forest of ancient endangered Koa trees (one of the most sought after Hawaiian hard woods). It is a beautiful area to visit and see these beautiful rare trees. The big island of Hawaii has some very unique beaches, as well as many great snorkeling spots. In addition to your typical white sandy beaches, you'll find some black sand beaches and even a green sand beach, at the south west end of the island. The popular Punaluu Black Sand Beach gets its color from volcanic black sand created from waves crashing against the lava rock. The PapaKolea Green Sand Beach gets its color from a semi precious green stone called Olivine that comes from volcanic magma. One of the most popular beaches on the island is Hapuna Beach just north of the Waikoloa resort area. Hapuna is a beautiful white sand beach which is great for swimming. There is also a wonderful white sandy beach in front of the Mauna Kea Beach Resort, just north of Hapuna Beach. All of the beaches in Hawaii are public beaches with public access, so you'll find no shortage. There are plenty of great snorkeling beaches and beautiful beach parks for relaxation. There are less sandy beaches in the southern volcanic areas but you'll find plenty of tide pools to explore as well as great snorkeling there. The three most popular snorkeling spots on the island are at Kahalu’u Beach Park, “Two Step” at Honaunau Bay, and around the Captain Cook Monument at Kealakekua Bay. These are all on the west side of the island south of Kailua-Kona. You will always find plenty of bays and coves for great snorkeling. However, don’t be afraid to ask any of the locals around if it is a safe spot. There are also plenty of snorkel and diving excursions that will take you to good places and keep you safe. Other islands attractions include golf, tennis, horseback riding, ATV tours, biking, hiking, Zip-lines, scuba diving, deep-sea fishing, surfing, helicopter tours, and much much more. You can find plenty of activities in and around the Kona, Waikoloa, and Hilo areas, as well as throughout the island. How about a massage at a world-class spa? There are plenty of those. If you don’t want to pay that much for a massage, we suggest the Aloha Massage Academy just south of Keauhou Bay. Pay a fraction of the price for an awesome massage from a student. You will not be disappointed. Want a once in a life time adventure? Perhaps the most popular and unique activity on the island is the Manta Ray night snorkel experience. This is offered at several places along the Kona and Kohala Coast. The dive boats use a series of bright submerged night lights to light up the night waters. This attracts plankton which thus brings in the magnificent and docile giant winged creatures, within inches of the snorkelers. The giant Manta Rays are not dangerous, they do not sting or bite. While on the island, you will hear many people boasting about having participated in this activity, and how exhilarating and enjoyable it was. Late November to early May are popular months for visitors, because this is Whale watching season. During these months the Humpback whales make their long migration from Alaska to the warm and safe waters of Hawaii, to give birth to their calves and mate. These 45-foot gentle giants are mostly visible from the shores of the western Kohala Coast. Nearly extinct at one time, these sea mammals are now protected and are thriving in numbers. There are many whale watching excursions available during this time period. Combined with a snorkeling trip, you can hear the whales singing under water. It is something you must experience. If you are not a big boating fan, you can easily see the whales breaching out of the water from a comfortable spot on the beach. The Big Island has some excellent restaurants with award winning chefs at the helm. Because this is a fertile island with lots of fresh produce, exotic fruits, and local farms, many restaurants offer a fresh farm-to-table dining experience. It is hard not to find daily fresh catch seafood prepared innovatively in island style. Ask your hotel concierge or any locals or regulars for their best restaurant recommendations. Ulu Ocean Grill - The Ulu Ocean Grill is an award winning oceanfront seafood restaurant located on the beach at the Four Seasons Resort property, south of Waikoloa. The food is fantastic, the ambiance is romantic, the service excellent, and the ocean view is spectacular. Location, location, location. Guest can enjoy open air seating just steps from the surf. The restaurant serves regional Hawaiian dishes and Pacific Rim cuisine that features fresh catch island seafood, fresh meats, local farm to table produce, and super fresh sushi. Menu selections are either oven-roasted, wok-fired, or flame grilled to perfection. They have a wonderful extensive wine list, full bar with signature tropical drinks, and a delicious dessert menu. Prices are moderate to expensive. This restaurant is great for special occasions or a romantic sunset dinner for two. The Canoe House – The Canoe House is an elegant oceanfront restaurant located along the beach at the Mauna Lani Resort. It serves fresh sustainable Hawaiian regional cuisine. The food presentations are visually appealing and the menu is innovative. They feature fresh local catch seafood, shellfish, and fresh meats like aged tenderloin, lamb and pork. The menu includes dishes like fresh sashimi, peppered Ahi, seafood pasta, slow braised short ribs, and crusted fresh Ono fish. White linen table cloths, warm wood tones, an open air dining room, and spectacular ocean view, make this the perfect romantic setting. The ambiance does not get much better than this. They have a great appetizer menu, an extensive wine list and a full bar. Prices are moderate to expensive. This restaurant is perfect for a romantic sunset dinner. Brown’s Beach House – The award winning Brown’s Beach House restaurant is located on the beach at the Fairmont Orchid Resort in Waikoloa. The menu is innovative Hawaiian Island inspired fine dining cuisine, using local fresh ingredients and attention to detail. The menu includes an array of appetizers, fresh local seafood and shellfish, filet mignon, pork tenderloin, delicious sides and decadent desserts. Brown’s Beach House includes an extensive wine list and full bar with classic and tropical drinks. Guests can dine in the open air while watching the sunset over the Pacific Ocean. The ambiance is elegant and the restaurant features nightly entertainment. The service is superb and the staff is friendly. Prices are expensive. The food is excellent and the setting is beautiful. Brown’s is perfect for a special occasion or romantic evening. Coast Grille – The Coast Grill is an upscale seafood and steak restaurant located at the Hapuna Beach Prince Resort, overlooking the pool and white sandy Hapuna Beach. It is a lovely setting featuring open air terrace or lounge dining. The restaurant serves super fresh seafood and steaks, paired with fresh local Big Island seasonal ingredients. The menu is innovative and the food is elegantly presented. The dining room includes a fresh oyster bar, with a design-your-own Hawaiian Poke menu. The menu includes an array of appetizers as well a large selection of sharing plates. Entrees include grilled New York steak, Hawaiian rib eye, an assorted seafood trio platter, seafood pasta, and even a fantastic burger and fish tacos. They have a good wine list and fabulous desserts. The Grill has a spectacular view for sunset, and serves awesome drinks. The food is wonderful, the service is superb, and the staff is professional and very friendly. Prices are moderate to expensive. This is an exceptional restaurant that is perfect for all occasions. Huggo’s & Huggo’s on the Rocks – Huggo’s Restaurnat features island style fine dining on the water’s edge. “Huggo’s on the Rocks” is Huggo’s ever so popular casual open air beach bar featuring a casual menu, where you can eat barefoot in the sand. 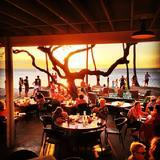 Huggo’s is located surf-side adjacent to the Royal Kona Resort in Kailua-Kona. The view of the ocean is perfect and the ambiance is relaxing. Huggo’s offers Pacific Rim seafood, steaks, and local Big Island farmed produce. The seafood is purchased daily from local fisherman, so it is super fresh. The menu includes extensive appetizers, salads, pastas, fresh island catch, cioppino, steaks, prime rib & chops. They have a nice wine list and great cocktails to sip while you enjoy the sunset. They also offer live entertainment many nights as well as a great happy hour. The food is very good and the service is quick and professional. Prices are moderate to expensive. Huggo’s is a good restaurant for all occasions, great for the whole family. You can eat fairly inexpensively at Huggo’s on the Rocks bar. Lava Lave Beach Club – From the same people that bring you Huggo’s restaurant, the Lava Lava Beach Club is probably the most popular restaurant on the island. It is a small beach bar restaurant on the beach. You can dine inside, on the deck, or dine at one of the many table placed out on the sand. It’s the ultimate fun island dining experience. It is located on the beach in Waikoloa just south of the Marriott Resort. People flock here at sunset every night to listen to live music, dine, drink and watch the sun go down over the Pacific, all while putting their toes in the sand. The restaurant serves relaxed island cuisine including creative preparations of fresh Hawaiian seafood, steaks, ribs, fresh fish tacos and burgers. They use locally sourced fresh ingredients. They feature nice wines and wonderful island style cocktails. The food is delicious, the service is great, and the prices are moderate to expensive. You must dine here for the perfect island style evening. Lava Lava is a must visit while on the island. The Kona Inn Restaurant – Owned by Wind & Sea Restaurants, the Kona Inn is located on the waterfront in the heart of old Kona Town, offering a beautiful open air setting with unobstructed views of the Pacific Ocean. The beautiful old wood interiors provide for a romantic setting to accompany the pristine view. The restaurant specializes in fresh seafood that is caught daily by local fisherman. The menu includes Hawaiian Poke, sashimi, large seafood cobb salad, a large selection of local catch fish, prime steaks, ribs and a selection of tasty sides & island desserts. They have a nice wine list and specialty cocktails. They feature a large Koa Wood bar that is a popular happy hour spot at sunset. The food is delicious and the service is super. This is a popular spot for dinner. It’s great for all occasions and good for family meals. Prices are moderate to expensive. They also have a popular bar menu with less expensive items like burgers, fish & chips, sandwiches and appetizers. You will have a good dining experience here. The Fish Hopper – The Fish Hopper restaurant overlooks Kailua Bay in beautiful downtown Kailua-Kona. It features a wonderful ocean view which is perfect for a sunset dinner. They feature a relaxed and casual Polynesian style décor with earth tones, large comfy booths at the rear, and a bamboo-roofed bar. The Fish Hopper is a fresh seafood and steak restaurant serving innovative internationally inspired cuisine. It is owned by the same people that bring you the Old Fisherman’s Grotto and Fish Hopper restaurant in Monterey California. In addition to fresh catch local fish, they fly in fresh fish from the mainland to offer a full seafood menu. The menu includes fresh Dungeness crab, Alaskan Halibut, wild salmon, steamed clams & mussels, scallops, prawns, lobster, steak, ribs, ceviche, and seafood cioppino. They even serve a great burger. They have a nice extensive wine list, delicious desserts, and great cocktails. They have an excellent staff that provide good service and make you feel welcome. The food here is wonderful and portions are good. This is a great family restaurant that also works well for romantic and special occasions. Prices are moderate to expensive. Pueo’s Osteria – Pueo’s is a wonderful little artisanal Italian restaurant located up the hill from Waikoloa in Waikoloa Village. Don’t let its strip mall location fool you. This is some of the best Italian cuisine on the island. The Tuscan inspired interior décor is beautiful, featuring relaxing soft woods, Tuscan tiles and art. It has a small intimate bar for socializing and you can choose to dine on their lovely open air deck. The food is delicious, plentiful, and the service is friendly and professional. They serve local fresh seafood, antipasti, home-made pastas, brick-oven pizza & breads, fine meats, veal, and produce from boutique farms and local farmers’ markets. They have an excellent seafood pasta and delicious bruschetta. They also have hand crafted desserts and a nice bar menu with good food. Their nice wine list features good Italian and California wines. This is a great family restaurant which is also good for couples seeking great Italian food. Prices are affordable to moderate. Sansei Seafood, Steakhouse & Sushi Bar – This popular Asian cuisine restaurant is located at the Queens Market Place shops in Waikoloa. The setting is lively & fun. The creative menu will please any palate. Sansei is often described as part Japanese, part Asian fusion and part Hawaiian cuisine. The sushi is super fresh and the ingredients are top quality. You'll find panko-crusted Ahi sashimi, Asian shrimp cakes, peppercorn grilled New York steak, bone-in rib eye, grilled pork chops, lobster tail, and a large selection of fresh sushi. You'll also find more standard items for the less adventurous like the grilled "Fresh Catch of the Day" over local island greens. Their sauces are innovative, like their ginger-lime butter and cilantro pesto. They serve some of the best sweet potato fries you will ever eat. They feature a nice selection of wines and have a full bar. This is great food. Highly recommended. The prices are moderate and there is an early bird discount for orders placed before 6:00 pm. Roy’s Waikoloa Bar & Grill – Roy’s is located at the Kings’ Shops in Waikoloa. This is a casual-yet-elegant bar & grill, serving up some of the best Hawaiian fusion cuisine. Award winning Chefs create food that is artistic with its vibrant colors, bold exotic flavors, Asian spices, and ultra-fresh island ingredients. The menu has a strong focus on seafood, with daily specials, a prix fix menu, and extensive award winning wine list. The appetizers are a delight. Many guests come in to have drinks at the bar and savor the appetizers. The Hawaiian blackened island Ahi and Roy’s classic trio dishes are superb. The desserts are a nice finish to a perfect meal. The restaurant is very popular. The food is excellent and the service is good. The staff is knowledgeable about the menu items and the wines. The restaurant is moderately expensive but highly recommended. Island Lava Java Bistro Grill – This small Bistro is located in the town of Kailua-Kona overlooking the ocean. It is a favorite spot for open air dining and enjoying evening live music. The restaurant focuses on fresh Big Island cuisine. The restaurant uses only grass fed Big Island beef, free range Big Island chicken, Big Island organic goat cheese, and locally grown organic produce purchased direct from island farmers. They have a bakery on site where they bake all of the pastries, muffins, desserts, breads and pizza dough daily. The menu includes an array of Hawaiian pupus & small plates, fresh bistro salads, fresh catch island seafood, steaks, ribs & chops, fresh home-made pasta & pizza, burgers, wraps and awesome fish tacos. They offer delicious desserts and nice 100% Kona coffee specialty drinks. The food is super fresh, the service is good, and the prices are moderate. They also have a small location in Waikoloa Village. Kona Canoe Club – The Kona Canoe Club is located in Kailua-Kona overlooking the ocean at the Kona Inn Shopping Village. Owned by the same people that bring you the Kona Inn Restaurant, the Kona Canoe Club is the perfect setting for a casual oceanside meal and bar drinks. They have a relaxing open air deck setting, with spectacular oceanfront views. The restaurant serves fresh seafood, ribs, fish tacos, salads, peal & eat shrimp buckets, fantastic burgers & sandwiches, and an array of pupus and appetizers. They serve an awesome large mud pie dessert that is always a favorite. Their food is hearty and delicious. They have a comfortable bar and large flat screen TVs to view your favorite sports games. The staff is super friendly, making you feel relaxed and welcome (no rush). Prices are affordable to moderate. This is a great place to come in for happy hour and to catch an affordable sunset dinner. The Blue Room Brasserie & Bar – The Blue Room is an intimate restaurant located at the Shops at Mauna Lani in the Waikoloa area. The restaurant serves French cuisine with Hawaiian influences. They have an intimate casual dining room with blue décor, an elegant wood and marble top bar, and feature a lovely outdoor covered dining patio. The menu includes chilled oysters from the raw bar, assorted seafood appetizers, foie gras, Hawaiian tuna poke, a devine roasted beet salad, lobster, bone-in rib eye, bouillabaisse, a nice seafood linguine, as well as burgers, sandwiches and lighter fare. Their desserts include a delicious Macadamia nut pie. They have an excellent wine list and good micro-brews and cocktails. The food here is really great, elegantly presented, and everything is super fresh. The service is excellent and friendly. Prices are affordable to moderate. You will enjoy an excellent meal here that won’t cost you an arm and a leg. Rays on the Bay – Rays is a large spacious open air restaurant, bar & lounge, located oceanfront at the Sheraton Keauhou Bay Resort. Rays on the Bay serves Big Island inspired Pacific Rim cuisine, featuring fresh local catch fish and farm to table produce. While dining you can enjoy an awesome sunset, and view the night diving boats shining bright under-water night lights that attract the giant Manta Rays. Rays is super lively, with live music nightly and a large popular bar. The menu includes Hawaiian appetizers, garden fresh salads, line caught fish, Kona coffee rubbed rib eye steak, slow braised wild boar, and banana Fosters with spiced rum caramel & coconut ice cream. They have a nice wine list as well as local craft beers, and signature tropical cocktails. The food is excellent and the service is good. It is an active social scene that has a very popular happy hour. Prices are moderate to expensive. Rays on the Bay is a fun dining experience. Other recommended restaurants in the Kailua-Kona area include Slasher’s Grill, Tropics Tap House, Sam Choy’s, Humpy’s Big Island Alehouse, Quinn’s Almost by the Sea, Outback Steakhouse, and Bubba Gump Shrimp Company. Other recommended restaurants in and around the Waikoloa area include Ruth’s Chris, Tommy Bahama Café, Tropics Ale House, Kawaihae Seafood Bar & Grill, the Kawaihae Plantation Grill, and the Hapuna Beach Prince Beach Bar. If you visit the Waimea cattle country, be sure to eat at Merriman’s or the Redwater Café. For cheap eats, there are plenty of Subway Sandwich Shops delis, and fast food establishments all over the island. The Big Island of Hawaii has all kinds of accommodations available for any budget. You will find plenty of upscale beachfront resort hotels as well as vacation rentals, condos, and timeshare resort properties. Contact VoyageMonkey.com Travel to help find your ideal accommodations. Let us know your budget and what you are looking for, and we will do all the work. Mauna Kea Beach Hotel Resort – This award winning luxury resort property is situated on one of the best and most beautiful crescent shaped sandy white beaches on the island. It’s a safe calm bay which makes it a perfect swimming beach. The property is situated along the Kohala Coast just north of Waikoloa. There are a total of 252 rooms including 10 luxury suites. All rooms are well appointed with modern amenities, private balcony, entertainment center, and elegant style. The resort includes a Robert Trent Jones championship golf course, 11 seaside tennis courts, oceanfront pool, and lush foliage and gardens. There are four restaurants and lounges (including the fine dining Manta Restaurant), world-class spa, 2,500 square-foot fitness center, salon, boutique shops, meeting & function rooms. The activities center and concierge service can handle most of your needs. This is an excellent resort for a romantic tranquil getaway. Hapuna Beach Prince Resort – This beachfront luxury resort property is located along the Kohala Coast, on beautiful Hapuna Beach north of Waikoloa. It is part of the 1,800 acre Mauna Kea Resort. The beach at this resort is one of the best white sandy beaches on the island, safe for swimming and beach activities. The hotel has 350 guest rooms, including 36 luxury suites. All rooms and suites are ocean facing. The spacious rooms feature private balcony, contemporary style and are well-appointed with all modern amenities. The resort includes a large open air lobby, lush manicured tropical gardens and grounds, a championship Arnold Palmer designed golf course, tennis, large beachfront infinity pool, whirlpool, salon, luxury spa and fitness center. There are 5 restaurants and lounges, including the popular Coast Grill. The hotel includes ballroom and conference facilities, as well as onsite shopping, activities desk and concierge services. This resort offers an excellent Big Island experience you will enjoy. Sheraton Keauhou Bay Resort & Spa – The Sheraton is one of the most popular hotels in the Kona area. The 4-star resort is situated on the Lava bluffs on the edge of Keauhou Bay, about 7-miles south of downtown Kailua-Kona. It’s an older resort with an awesome property, and a casual island vibe. The resort offers authentic Hawaiian hospitality and culture, through its cuisine, complimentary Lei making, Ukulele lessons, Hula dancing lessons, Manta Ray learning center, weekly luau, and more. The Sheraton features 485 guest rooms and 25 luxury suites, all with stylish island inspired design, contemporary amenities, and large private balcony. The property has a large open air lobby with a bay view, and lush manicured gardens and grounds. There are four restaurants and lounges, including the popular Rays on the Bay which features nightly live music. The resort includes tennis, multi-level mega swimming pools, a sandy bottom children’s pool, a water slide, a world-class spa and fitness center, volleyball court, and complimentary trolley service to local shopping and attractions. Guests have golf privileges at the Adjacent Kona Country Club golf course. The Sheraton has a children’s center, onsite shop, pool & ocean activities center, as well as helpful concierge services. This is a great resort for families who want to stay in the Kona area and couples that don’t need a 5-star rated resort. Hilton Waikoloa Village – The 4-star Hilton is currently the largest resort on the Big Island. So large, it actually has a Disney-monorail -style tram to get you around the property, as well as canal boats. It is situated on 62 oceanfront acres in Wailoloa. The resort boasts 1,243 guest rooms, including 59 luxury suites. All rooms and suites are tastefully decorated and fully appointed with modern amenities. The resort includes 8 restaurants and 6 bars & lounges, three pools, Jacuzzis, private cabanas, a four acre swimming lagoon, water slide, two championship golf courses, a seaside putting course, 8 tennis courts, luxury spa and fitness center, a black sand beach, and an interactive Dolphin encounter lagoon. The grounds are beautifully manicured with lush gardens, walkways and water falls. There is a large open air lobby and onsite shops. They have meeting and conference facilities, activities center and full concierge services, kids’ activity program, onsite Hawaian luau, live music, oceanside wedding chapel, and shuttle service to golf courses and local shopping. This resort has it all. This resort is perfect for families and people who enjoy the mega resort experience. Four Seasons Resort Hualalai – This award winning 5-star beachfront resort is located around 8-milles north of the Kona International Airport along the Kona-Kohala Coast. The resort consists of multiple intimate two-story bungalows scattered throughout the 58-acre property, all connected by landscaped paths, immaculately manicured gardens, ponds and pools. They offer 250 chic guest rooms, suites and villas, all with indigenous nature-inspired décor, Hawaiian art, private furnished patios or balcony, granite bathrooms with large soaking tubs & separate showers, and full modern amenities. The resort features seven swimming pools, three restaurants (including the popular ULU Ocean Grill), two bar lounges, 28,000 square-foot luxury spa & fitness center, 18-hole golf course, 8 tennis courts, and white sandy beach. They also have meeting space, ballrooms and banquet rooms, cultural center, and an extensive local art collection dating back to the 1700’s. The personal service at the resort is excellent. They feature twice-daily housekeeping service, exceptional concierge services, and 24-hour in-room dining. This resort is perfect for the traveler that needs that 5-star service and amenities. The Fairmont Orchid Hawaii – This beautiful oceanfront resort property is set on 32-acres at Pauoa Bay in Waikoloa. The resort offers 540 luxurious guest rooms and suites, each with private furnished balcony, elegant contemporary décor, spacious marble bathrooms with separate shower and tub. Rooms are well appointed with all modern amenities. Resort amenities include a 10,000 square-foot oceanfront swimming pool, lush tropical gardens, an outdoor spa, 24-hour fitness center, salon, onsite shops, six restaurants (including the popular Brown’s Beach House), two adjacent 18-hole golf courses, 10 tennis courts, a white sand lagoon, and a lovely white sandy beach with beach chairs and cabanas. The resort includes extensive meeting and events facilities. The service at the resort is excellent. They offer excellent concierges services, baby-sitting, in-room dining service, laundry service, as well as complimentary shuttle service to local shopping and restaurants at the Shops at Mauna Lani. The staff is responsive to your special requests. This is a great resort for couples and families looking for upscale but not over the top accommodations, and great service. Mauna Lani Bay Hotel & Bungalows – The Mauna Lani is a beautiful oceanfront resort located along the Kohala Coast in Waikoloa. The resort includes 318 luxurious guest rooms, 18 luxury suites, and bungalows with 4,000 square-feet of living space, private pool and jacuzzi. The spacious guest rooms, suites and bungalows are all tropical inspired with elegant island décor, full amenities, including private furnished balconies or patio. The resort features a large open air atrium in the lobby with palm trees, waterfalls and ponds. There are two championship golf courses, a luxury spa and fitness center with a lap pool, oceanfront pool, three restaurants (including The Canoe House), bars, fish ponds, walking paths, gardens, and white sandy beach. They offer complimentary Hula lessons, Ukulele lessons, Lei making classes, bicycles, tours and other cultural activities. The resort also has complimentary shuttle service to the shops at Mauna Lani. This resort offers an excellent Big Island Experience and wonderful friendly aloha spirit. Excellent for families and couples. Waikoloa Beach Marriott Resort & Spa – The Marriott is a lovely 4-star beachfront resort situated on 15-acres overlooking Anaeho’omalu Bay in Waikoloa. There are 290 guestrooms and 5 suites available. Guest rooms feature Polynesian décor, sitting areas, Floor-to-ceiling windows, full modern amenities, 300 thread-count linens, table & desk, bath tub, and private furnished balcony. The resort includes several onsite dining restaurants, bars, ocean-side infinity swimming pool, hot tub, ancient fish ponds, tennis, full service spa, fitness center, barber & beauty shop, gift shop, and business center & meeting space. The resort includes a white sandy beach with a beach activities center. You can walk down the beach to the popular Lava Lava Beach Club Restaurant and Beach Bar. The Marriott is also walking distance to premier offsite shopping, dining and two adjacent championship golf courses. The concierge desk can assist you with all your reservations and activities. This resort has a great location and a casual vibe. It’s a Marriott, great for families and couples that don’t need all the 5-star perks, but love being in the heart of the Waikoloa area. Other hotels we recommend in the Kona areas include the Kona Coast Resort, the Mauna Loa Village, the Royal Kona Resort, the Royal Seacliff Resort, and the Kona Marriott Courtyard. If you are staying in the Hilo area you'll find the Castle Hilo Hawaiian, the Naniloa Volcanoes Resort, the Hilo Bay Hotel, or the Hilo Seaside Hotel which all offer good accommodations and location. The Big Island of Hawaii is the ultimate tropical island vacation destination. Leave your cares behind and treat yourself to the aloha spirit. There are many Big Island vacation package deals offered by VoyagMonkey.com Travel. VoyageMonkey.com can provide your flight, hotel accommodations and rental car for your big Island adventure. Easy online travel booking makes it simple and affordable to visit the big island. Book now on VoyageMonkey.Com.